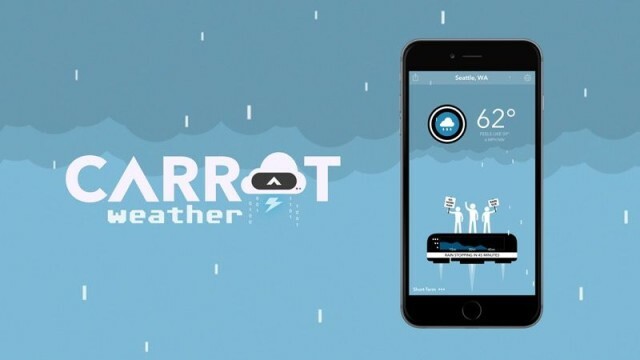 The weather app that’ll make you LOL even when it’s raining. “Fun” isn’t often a word I’d use to describe the ability to check the weather forecast on your iPhone. Thanks to a new app from developer Brian Mueller, however, that’s exactly what it now is. Mueller’s CARROT Weather app is an eerily accurate weather app which serves up twisted meteorological predictions. Powered by existing weather app Dark Sky, CARROT Weather serves up hilarious weather scenes with its predictions, so that cloudy weather is accompanied by dancing nuclear smokestacks (of course! ), snow unleashes evil penguins (what else? ), and tornados are signified by flying sharks (is there any other choice?). Check out more of the deets below. Anyone who has used one of Mueller’s CARROT apps before (other offerings include fitness and calorie counting apps) will know what to expect in terms of the acerbic talking robot that serves as the app’s interface. With over 2,000 lines of dialog, it’s great fun — and the fact that it actually offers ridiculously detailed predictions based on minute-by-minute, 24-hour and 7-day forecasts only makes it better. CARROT Weather is available for the iPhone and iPad today, priced at $2.99. Download it from the App Store here. This entry was posted in Apps and tagged app, CARROT Weather. Bookmark the permalink. iPhone 6s concept: Apple Watch crown added. Ring Video Doorbell is a simple smart home accessory that puts security first.